By Rebecca Roller, M.D., Alison Chetlen, D.O., Claudia Kasales, M.D. Breast implant procedures have been performed since the late 19th century for augmentation, correction of congenital abnormalities, and post-mastectomy reconstruction. Over the years, the surgical options and types of implants available have evolved. 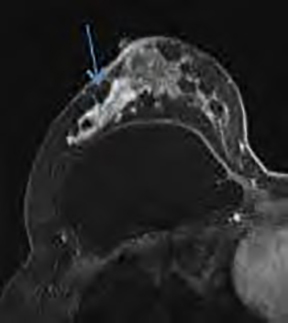 As a result, the augmented breast can have a widely variable appearance, and the practicing radiologist must recognize the numerous variations in implant construction that are encountered clinically. This article reviews the normal appearance, as well as early, late, and rare complications associated with different types of breast implants. Proper diagnosis of implant complications requires a thorough understanding of the imaging characteristics of normal implants. Single lumen silicone and saline implants, which consist of a single polymer shell filled with silicone or saline, are the most frequently used devices for breast augmentation/reconstruction. Saline implants have a valve to allow volume adjustment, which helps identify them on MRI. The classic double lumen implant contains an outer saline shell with silicone on the inside, while reverse double lumen implants have an adjustable inner saline shell and outer silicone shell.2,4,5 MRI sequences that are selective for silicone and fluid help differentiate the implant type. Implants may be placed in a prepectoral or retropectoral location. 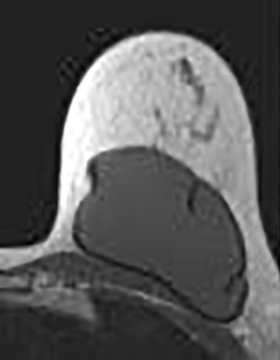 The benefits of placing implants behind the pectoralis muscle include decreased incidence of capsular contracture and improved visibility of the breast tissue on mammography.7,8 Locating the position of the muscle on MRI using the sagittal images can help differentiate the implant position (Fig. 1). Normal implants are triangular in shape. 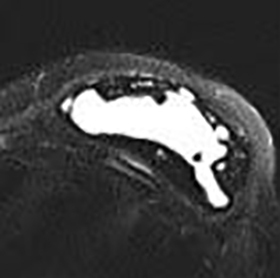 They may have numerous and/or complex radial folds on MR imaging which should not be confused with rupture (Fig. 2). Implants placed for congenital abnormalities such as Poland syndrome or pectus deformity may have an atypical or asymmetric appearance which should not be confused with malpositioning. 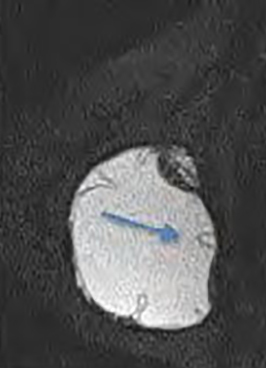 Clinical history can help determine whether the implant is truly malpositioned. Breast implants are categorized into five implant generations reflecting product development over time. The recent generations of silicone gel implants have a cohesive viscous silicone gel, and as a result, these implants will rarely have a totally collapsed implant shell with rupture, differing from the older generations (Fig. 3). Most of these demonstrate gel leakage and silicone migration.2 The third and fourth implant generations offered models of breast implants with textured or uniformly smooth surfaces. 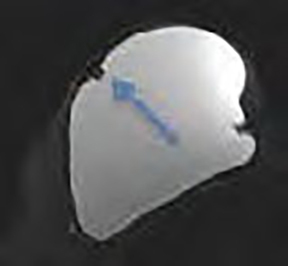 Before implant insertion, especially in oncoloplastic breast reconstruction, a tissue expander is usually placed into the mastectomy site to stretch the remaining skin in preparation for the placement of a permanent implant.2 The expander is placed in its collapsed form and fluid is introduced into the tissue expander to slowly inflate it. This process may continue for several weeks or months until the tissue expander is filled to an optimal volume for permanent breast implant placement. 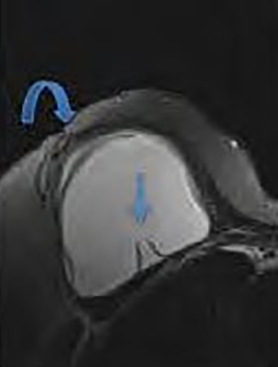 Some breast tissue expanders should be considered a contraindication to MRI because of the magnetic marker of the filling valve (Fig. 4). Expander manufacturers list possible consequences such as overheating, possible expander displacement, and possible reduction of magnetization of the marker. Implant complications that occur in the immediate post-surgical period include the development of collections around the implant and infection. Small seromas or peri-implant fluid collections are considered normal and are favorable. They are felt to be reactive and related to inflammatory response to the implant. 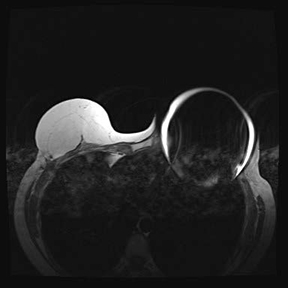 Small seromas present as T2 hyperintense fluid collections around the implant on MRI (Fig. 5a). This fluid may be beneficial as it may prevent capsular contracture and implant damage from minor trauma.4 Large or rapidly growing seromas, however, are problematic (Figs. 5a and b). They can be painful, cause deformity, and increase the risk of infection. Therapeutic aspiration or percutaneous drainage of fluid can be performed when large seromas become symptomatic. Older implants made of polyurethane (no longer used in the United States) can undergo chemical breakdown, inciting an inflammatory response that could lead to the development of complex seromas.5,9 However, such fluid collections are usually a late complication of breast implants. Delayed complications seen in breast implants include the development of contractures, implant rupture, and gel bleed. 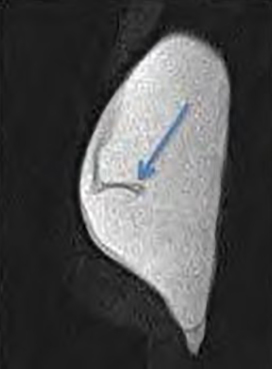 macroscopic silicone extending within the fibrous capsule.1 If rupture occurs and the implant collapses, the “linguini sign” (multiple curvilinear low signal intensity lines within the T2 bright silicone) will be evident on MRI. 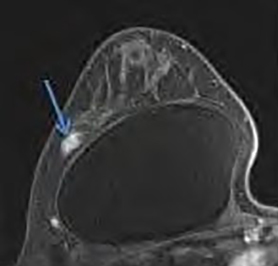 An earlier sign of rupture where the shell has not completely collapsed produces the “subcapsular line,” “keyhole,” “noose,” and “tear drop” signs on MRI (Fig. 6). The key to distinguishing these signs from a radial fold is identifying silicone on both sides of the implant shell. 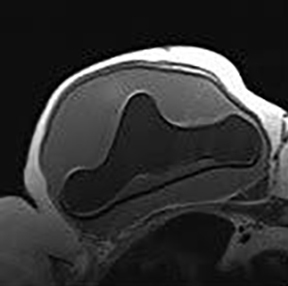 This can be challenging and multiplanar imaging is helpful, particularly using a combination of both axial and sagittal images. Rare complications of implant placement include the development of new or recurrent breast cancer and post-operative or delayed hematomas. Anaplastic large cell lymphoma is exceedingly rare, but should be considered in any patient with persistent fluid collections around the implant. Hematomas are commonly seen in the peri-operative period. They can be large, painful, and require drainage. Delayed hematomas are rare, caused by trauma, coagulopathy, capsular tear, recurrent cancer, or infection.16 On MRI, hematomas appear as complex fluid collections (Fig. 10). 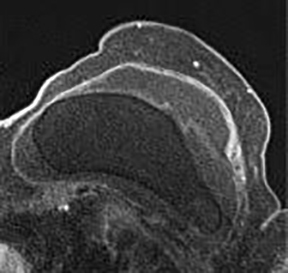 Implants do not increase the risk for breast cancer; however, they can make detection of breast cancer by mammography and US more challenging.2,7 MRI is an imaging technique to evaluate the entire breast and chest wall. 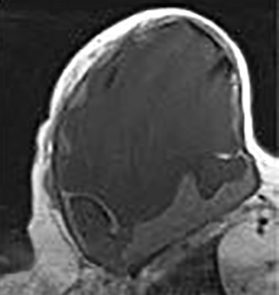 MRI evaluation using dynamically enhanced T1 FS MRI sequences allow identification of suspicious enhancing masses and non-mass like enhancement (Figs. 11 and 12). These suspicious findings should be further evaluated with biopsy, as in patients without implants. In conclusion, MRI is the best tool for imaging evaluation of acute and delayed breast implant complications. 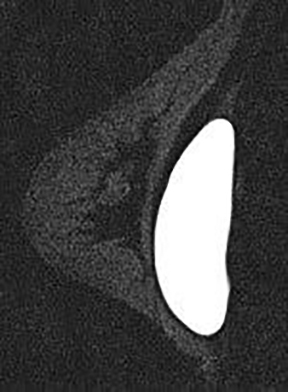 Normal implants are triangular in shape and may have numerous or complex radial folds, which should not be confused with implant rupture. Understanding and recognizing potential complications of breast implants and their significance helps facilitate prompt and appropriate management. The most common complications include contractures and implant rupture. 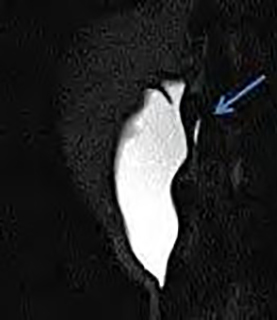 Characteristic imaging findings of intracapsular implant rupture include the “linguini,” “subcapsular line,” “keyhole,” “noose,” and “tear drop” signs on MRI. Small peri-implant fluid collections are normal and may reduce trauma to the implant. Large, complex collections, on the other hand, particularly when delayed and persistent, may be representative of infectious or rarely neoplastic implant complications. Holmich LR, Vejborg I, Conrad C, et al. 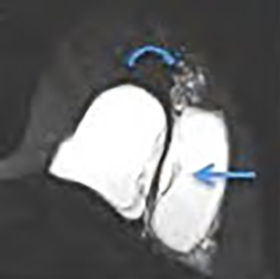 The diagnosis of breast implant rupture: MRI findings compared with findings at explantation. Eur J Radiol. 2005; 53(2):213-25. Juanpere S, Perez E, Huc O, et al. 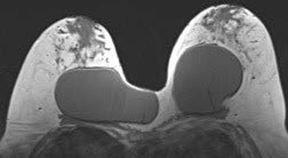 Imaging of breast implants-a pictorial review. Insights Imaging 2011; 2(6):653-70. Tark KC, Jeong HS, Roh TS, et al. Analysis of 30 breast implant rupture cases. Aesthetic Plast Surg 2005; 29(6):460-9. Glynn C, Litherland J. Imaging breast augmentation and reconstruction. Br J Radiol 2008; 81(967): 587-95. O'Toole M, Caskey CI. 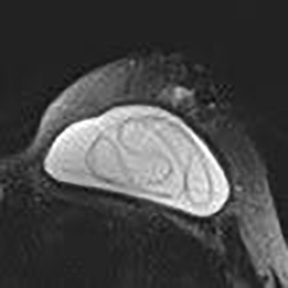 Imaging spectrum of breast implant complications: mammography, ultrasound, and magnetic resonance imaging. Book Imaging spectrum of breast implant complications: mammography, ultrasound, and magnetic resonance imaging. City: Elsevier; 2000; 351-61. Amano Y, Aoki R, Kumita S, et al. 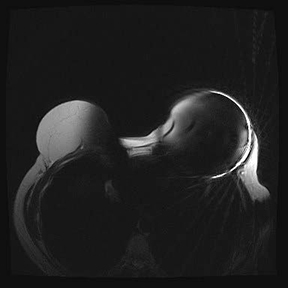 Silicone-selective multishot echo-planar imaging for rapid MRI survey of breast implants. Eur Radiol 2007; 17(7):1875-78. Handel N, Silverstein MJ, Gamagami P, et al. Factors affecting mammographic visualization of the breast after augmentation mammaplasty. JAMA 1992; 268(14):1913-7. Biggs TM, Yarish RS. Augmentation mammaplasty: retropectoral versus retromammary implantation. Clin Plast Surg 1988; 15(4): 549-55. Stavros AT, Rapp CL. Nontargeted indications: mammary implants. In: Stavros AT. Breast ultrasound. Philadelphia, PA: Lippincott Williams & Wilkins; 2004: 199-275. Pittet B, Montandon D, Pittet D. Infection in breast implants. Lancet Infect Dis 2005; 5(2): 94-106. Hölmich LR, Friis S, Fryzek JP, et al. Incidence of silicone breast implant rupture. Arch Surg 2003; 138(7): 801-6. Hölmich LR, Vejborg IM, Conrad C, et al. Untreated silicone breast implant rupture. Plast Reconstr Surg 2004; 114(1):204-14. Herborn CU, Marincek B, Erfmann D, et al. 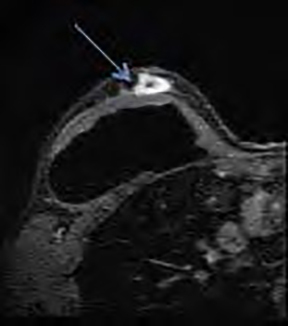 Breast augmentation and reconstructive surgery: MR imaging of implant rupture and malignancy. Eur Radiol 2002; 12(9): 2198-206. Hölmich LR, Fryzek JP, Kjøller K, et al. 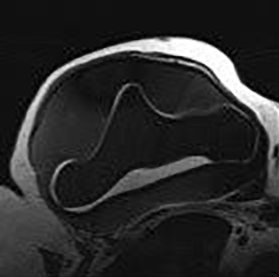 The diagnosis of silicone breast-implant rupture: clinical findings compared with findings at magnetic resonance imaging. Ann Plast Surg 2005; 54(6): 583-9. Caskey CI, Berg WA, Hamper UM, et al. Imaging spectrum of extracapsular silicone: correlation of US, MR imaging, mammographic, and histopathologic findings. 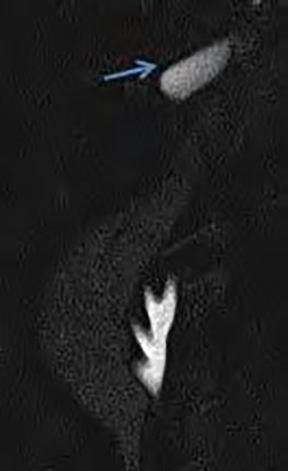 RadioGraphics 1999; 19(suppl 1): S39-S51. Seth AK, Kim JY. 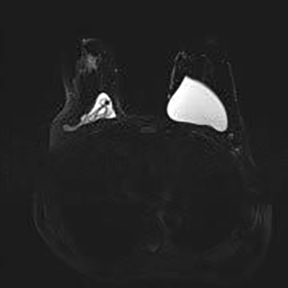 Acute symptomatic hematoma with defined etiology seven years after breast reconstruction: a case report and literature review. Can J Plast Surg 2010; 18(2): e27-9. U.S. Food and Drug Administration. Anaplastic large cell lymphoma (ALCL) in women with breast implants: preliminary FDA findings and analyses. FDA, January 2011. Available at http://www.fda.gov/medicaldevices/productsandmedicalprocedures/implantsandprosthetics/breastimplants/ucm239996.htm. Accessed December 18, 2013. Altekruse S, Kosary C, Krapcho M, et al. SEER cancer statistics review, 1975-2007: Bethesda, MD: National Cancer Institute, 2010. Available at http://seer.cancer.gov/csr/1975_2007. Accessed December 18, 2013. 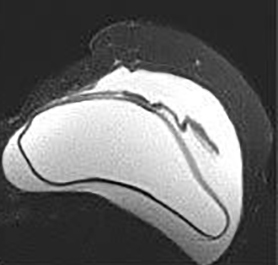 Parra JA, Fernandez MA, Encinas B, Rico M. Morel-Lavallee effusions in the thigh. Skeletal Radiol 1997; 26: 239-241. 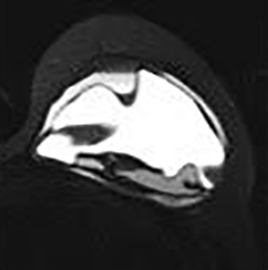 Roller R, Chetlen A, Kasales C. Imaging of Breast Implants and Their Associated Complications. J Am Osteopath Coll Radiol. 2014;3(1):2-9. Rebecca Roller, M.D., Alison Chetlen, D.O., Claudia Kasales, M.D. Dr. Roller, Dr. Chetlen, and Dr. Kasales work with the Department of Radiology, Penn State Milton S. Hershey Medical Center, Hershey, PA.